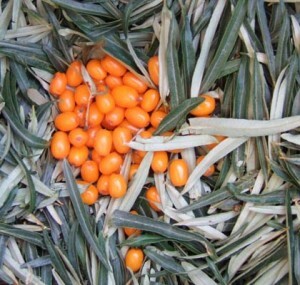 Seabuckthorn berries are tart, rich and tasty. They have 15 times more vitamin C than oranges, and contain vitamin E, carotenoids, amino acids and polyphenols. Seabuckthorn berries are available for U-Pick at Clear Sky in September, by request, call us at: 250-429-3929. We will pick berries by order in August 2016 – please use the form below to place an order or inquiry.